We are engaged in offering a wide variety of Designer Headstall. These are manufactured by our competent and skilled professionals. These are featured with precise stitching and can be availed from us at affordable prices. Sun Leather was established in the year 2001. We are manufacturer, supplier and exporter of Casual Belt, Formal PU Belt, Men Belt, Dressage Saddle, Leather Saddle, Jumping Saddle, Western Saddle, Synthetic Western Saddle, Tooled Western Saddle, Leather Headstall, Horse Headstall, Leather Bridle, Horse Bridle, Leather Halter, Horse Halter etc. We tend to provide high quality products that combine performance with value pricing while establishing a successful relationship with customers and suppliers all over. We are delivering world class, high quality, fashionable and trendy products. 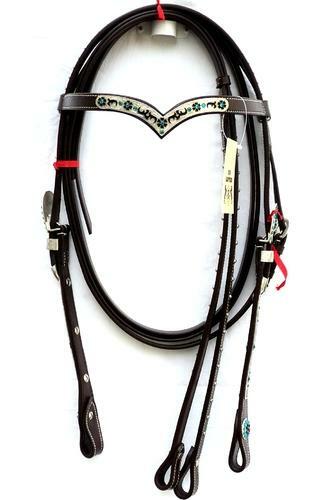 Our catalog compiles a wide range of belts and equestrian products. Our leather products is manufactured from the premium quality leather, which is manufactured in our unit. We offer various types of, equestrian products and all types of leather belts. Our products are accessible at the most competitive prices. Sun Leather was pioneered by Mr. Asif Khan with the valuable experience and all their strengths put together in India's leather goods industry. Sun Leather is associated with an array of prestigious client situated in USA and other European countries. Last but not the least, we always wish to establish long terms business relations with all our buyers. Our reliance on modern production technology has enhanced our ability to guarantee the highest level of precision and quality at competitive prices. Further, contribution of our team of experts has helped us in executing a quality project in the most productive and efficient manner. Our talented team of employees work in sync with our clients to understand their requirements and design cost effective and customized saddlery products.